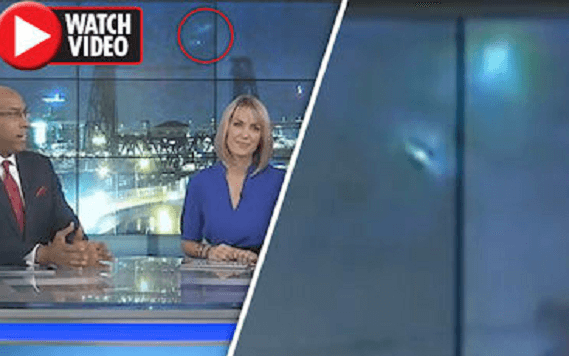 Unidentified flying objects appeared on camera on a live television news broadcast. The video clip shows a panel of presenters discussing the top news of the day. As they are conversing, they are not aware that something amazing is taking place in the background. The footage shows two UFOs moving across the sky in the background before changing direction entirely and turning aside suddenly into the distance. The hosts appear not aware and continue their broadcast. The clip appeared on KOIN 6, a US television station, and was soon afterwards uploaded to YouTube channel The Hidden Underbelly. Viewers were amazed to see that UFOs are now showing up on the news cameras as well. Some critics say that it was just a lens flare, but many believe that it was the real deal. The UFO video comes following a series of reported UFO sightings recently.